Some copies were printed with no gold text/logo on the front. Frontispiece illustration changed to "Man's Progressive Approach to the Poles". The final part of the permissions statement on the copyright page changed from, "who may quote brief passages" to, "who is welcome to quote brief passages". 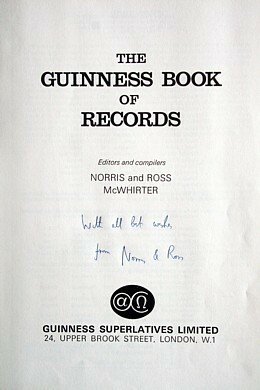 First edition to have the signatures of Norris and Ross McWhirter on the Preface page. The preface says, "over 500,000 copies of the Guinness Book have been published". "The Arts and Entertainment" section added. "Accidents and Disasters" moved to a single table in the "Human Achievements" section. On the Contents page, the page number for this new table is incorrect. The list of illustrations has been removed. As with the previous edition, significant members of the production team are acknowledged: Miss Rosemary Mendus (later Rosemary Bevan, "our most able secretary") and Miss J. E. S. Blair (Judith Blair, her replacement). 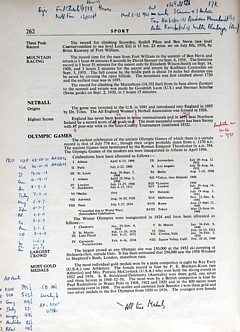 Modifications to five pages in the late additions and amendments on page 277, together with a list of new records equalled or improved at the 1960 Olympic Games in Rome. The dust-jacket says, "Fully Revised Edition 1961". A small paper insert (between the frontispiece and title page) describes Gagarin's orbit of the Earth, and the altitude and speed records that had been broken. This edition marks the first appearance of a list of editions on the copyright page. Peter B. Page, Esq. (the London office manager) and E. C. (Ted) Henniker, Esq. are noted in the amended acknowledgements section. Modifications to twenty-five pages in the late additions and amendments on page 277. One new quote from "A B.B.C. Librarian"
Possibly the first mention of, "According to the Guinness Book of Records ..."
Two older quotes removed, including, "This enchanting book sets up a record of its own". Perhaps that was deemed to be untrue in 1960. Laminated copies are also available. Frontispiece illustration changed to "The World's Most Expensive Painting". This edition notes that, "In keeping with the standardization sought by the Booksellers' Association, the Librarians' Association and the Publishers' Association, it has been decided to designate earlier editions thus:". The editions list then refers to the First edition to the Tenth Edition, rather than the edition/impression designations used previously. A new Foreword written for this edition. "The Universe" section renamed "The Universe and Space". This edition has a separate section in the acknowledgements to thank the production team: Mrs. Barbara Anderson (née Robinson, "the fastest at typing"), Mrs. Rosemary Bevan ("our most able secretary"), Miss Judith Blair (her replacement), Miss Anne Boulter, Miss Trudy Doyle ("the most indefatigable"), E. C. (Ted) Henniker, Esq., R. E. Marler, Esq., Mrs Margaret Orr-Deas (née Kierulf), Peter B. Page, Esq. (the London office manager) and Andrew Thomas Esq. ("who must surely rank as the person more conversant with the intricacies of the United Nations Statistical Annuals and Demographic Year Books than any other Briton"). Modifications to thirty-six pages in the late additions and amendments on page 292. 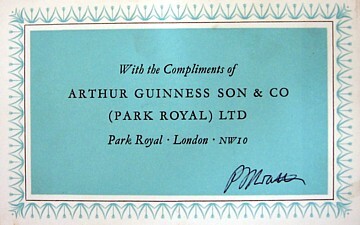 We also know of a copy with a large presentation sticker (right), presumably from the Guinness Storehouse in Dublin. Boxed copies were (probably) given to Guinness employees. The dust-jacket says, "Including Records in Tokio Olympics". Text removed from the front dust-jacket flap. Foreword says, "We have now produced over one million copies". The contents page now references "Late Additions and Amendments". This edition uses the acknowledgements section to thank additional members of the production team: Miss Christine Forsyth, Mrs Anne Symonds (née Boulter) and Miss Angela Wilkinson. Changes to twelve pages caused by records set at the Tokyo Olympic Games are given on pages 305 and 306. Changes to two pages caused by the UK General Election of 1964 are given on page 306. Modifications to fifty-nine pages in the late additions and amendments on pages 307 and 316. Critics' quotes removed from the rear dust-jacket flap. Title page now says, "Compiled by Norris and Ross McWhirter". 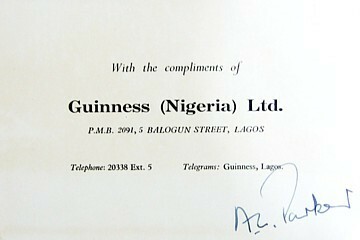 The editions list gives the publication date as "October 1965". The 12th and subsequent editions give it as "November 1965". Foreword says, "We have now produced well over one million copies". The preface says, "It is the first time since 1956 that a new edition has appeared at an interval of only twelve months after its predecessor. Such is the pace of modern record breaking that annual production may well become our rule". The preface says, "The co-compilers wish to pay special tribute to the researches of their colleague Andrew Thomas". "The Animal Kingdom" section renamed "Animal and Plant Kingdoms". "The Arts and Entertainment" section renamed "The Arts and Entertainments". The acknowledgements section thanks more members of the production team: Miss Winifred (Winnie) Ashe, Mrs Angela Hoaen and Miss Jane Parker. Modifications to seventy-eight pages in the late additions and amendments on pages 323 to 325. Photographic acknowledgements re-introduced on page 326.
for Redwood Press Trowbridge Wiltshire. Title page now says, "Norris and Ross McWhirter". The printer changes for the first time to Redwood Press, which had been founded by the McWhirters, with Gordon Nutbrown as Managing Director. For this edition, printing was sub-contracted to Billing and Sons in Guildford. The official opening of the print works in Trowbridge was on 8th February 1967 and within 4 years it was printing one in every nine titles published in Britain. Note on copyright page says, "Forthcoming editions in the Japanese and Danish languages will be available during 1967". Foreword says, "We have now produced over 1,500,000 copies". The preface says, "Most prominent in assisting in this work has been Mr. G. L. Wood". The preface says, "We are much indebted to Mr. Pierre Couderc of California for his researches". First edition with colour plates (other than for the frontispiece). More members of the production team are acknowledged: Miss Hillary Tippett and Miss Diana Wilford. Modifications to forty-one pages in the late additions and amendments on page 334. The compliments slip below comes from a copy sent to Henry Button. We also have a printer's proof (or publisher's proof) copy (pictured right), which is simply bound in pale blue/grey boards. The text appears to be identical to the published edition, but the proof copy has no photo plates. Redwood Press of Trowbridge, Wiltshire. A laminated copy is known. Our copy has a compliments slip from "M.C.M. 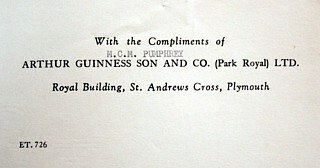 Pumphrey, Arthur Guinness Son and Co. (Park Royal) Ltd. Royal Building, St. Andrews Cross, Plymouth". Title page now says, "Editors and Compilers Norris and Ross McWhirter" and "Associate Editor and Compiler Andrew Thomas". Copyright page now lists "overseas" editions. Note on copyright page says, "An edition in Norwegian is also being published in 1968". This edition notes that typesetting is by "Moorgate Typesetting Co. Ltd., 20 Brixton Road, London, S.W.9". Foreword says, "We have now produced nearly 2,500,000 copies". Page facing the contents page is, "Evolution of Records in the 20th Century". "The Human World" moved after "The Mechanical World". Colour and black-and-white illustrations now part of the text (first edition with colour lithography). The acknowledgements section thanks more members of the production team: Harold C. Harlow, Esq., Gordon M. Nutbrown (Redwood Press), John Rivers, Esq., Miss Wendy Shore, Mrs. Judith Sleath and Miss Diana Wilford. Modification to fifty-three pages in the late additions and amendments. Redwood Press of Trowbridge, Wiltshire, England. Title page now says, "Editors and compilers Norris and Ross McWhirter". Foreword says, "We have now produced over 4,000,000 copies". Page facing the contents page is, "Progressive Human Altitude Records". "Sport, Games and Pastimes" renamed "Sports, Games and Pastimes". In accordance with the McWhirters' wishes, the acknowledgements section thanks more members of the production team: Mrs. Christine Bethlehem, Mrs Pamela Croome and Mlle Béatrice Frei. A special mention is given to Andrew Thomas (Associate Editor 1964-68). Modifications to forty-three pages in the late additions and amendments. "The Guinness Book of Records" on the spine is inverted compared to previous editions. 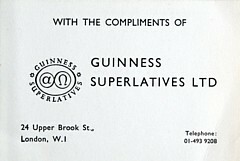 The Guinness Harp logo on the front cover is replaced by the Superlatives logo. Page facing the contents page is, "Thirty Nine Steps to the Moon". 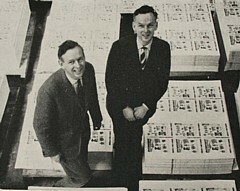 The 250,000 dust-jackets for this edition (pictured with Norris and Ross McWhirter below) were printed in one day at Redwood Press in Trowbridge. Some copies say "(Revised - November 1969)" on the copyright page. 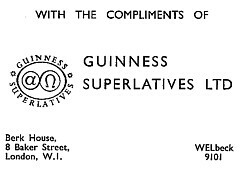 These editions also omit the Guinness Superlatives logo from the title page. The acknowledgements section adds more members of the production team: David Hoy, Esq. (an auditor from Dunlop who joined the team in 1966) and Mrs Jane Mayo. Modifications to sixty-six pages in the late additions and amendments. Some editions have additional minor changes (the page number of the last amendment changes from 365 to 366). Inside covers now have "A Check List of the World's 266 Countries", but there are only 226 countries listed. Some copies have the correct count of 226 on the inside back cover. Oddly, all copies have the country count as 227 on page 197 (which is itself revised to 226 in the 17th edition). The vast majority of copies have cerise covers, but some have red covers. No hardback copy with 226 on the front inside cover is known; the Christmas paperback revised special edition has the correct country count front and back (yet has the unmodified amendments section). Quite what caused this confusion is not clear. We believe that although these editions were printed by Redwood Press in Trowbridge, they were probably shipped to Pitman Press (later Bath Press) in Bath for binding. Given the volume of books printed, there could well have been an overlap between the introduction of revised covers and revised contents.